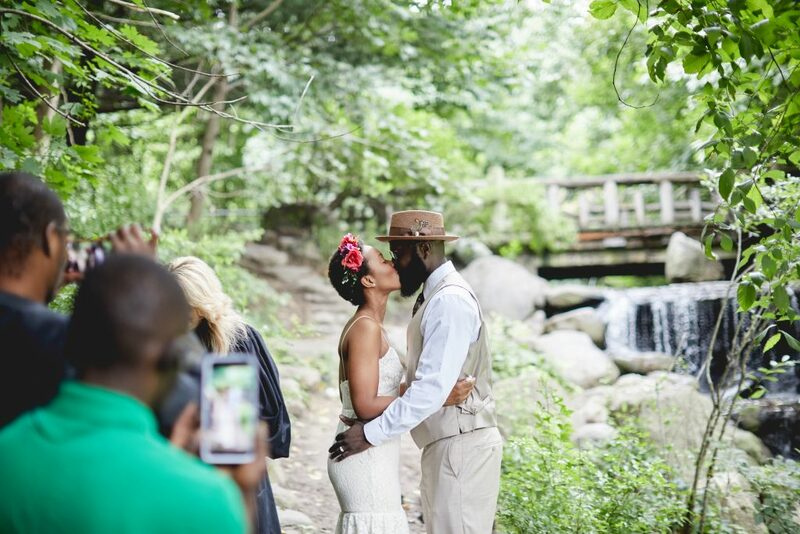 There’s no shortage of beautiful places to elope in NYC. 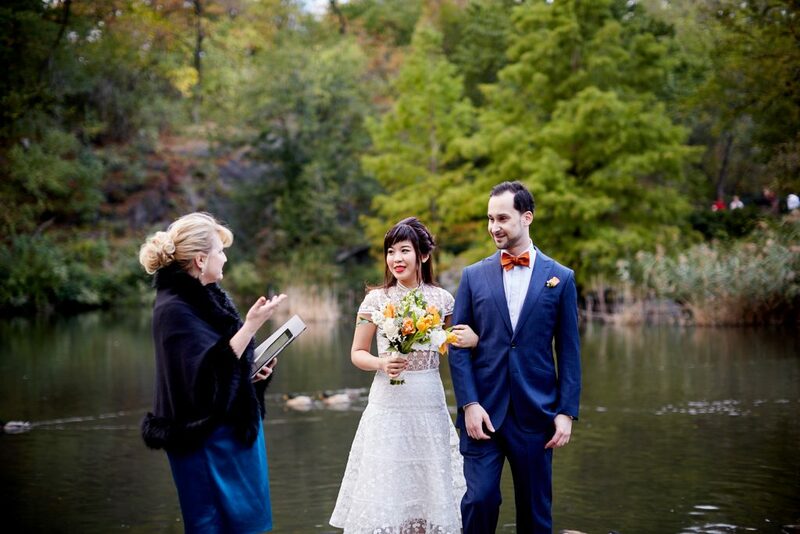 Here are some of our favorite venues in New York City for an elopement. The best part? Many of these locations are free or affordable! Wagner Cove is an ideal location for a wedding ceremony or vow renewal. It is easily accessible from the street and not too far embedded in the park. This means brides, grooms and guests won’t need to walk great distances in fancy wedding attire. Yet, despite being in the middle of it all, it is relatively secluded. Discreetly marked with a small stone and plaque, with a tiny set of stairs leading to a little shelter on the water. The covering is open, but may provide some bit of protection should the weather act up. Wagner Cove is surrounded by the pond, keeping onlookers away from the area. The setting – situated by the water and with a great city backdrop, Wagner Cove is a terrific location for beautiful photographs. Around 5th Avenue and 67th Street, one can gaze atop a little hill in Central Park to find a nuzzled and private gazebo. The sweet spot, unnamed minus a plaque reading “A Tree House for Dreaming,” features beautiful views all around, as it’s perked up on a small hill. This treehouse is nearly always empty, so it is perfect for a secret elopement or small ceremony. I recently officiated a moonlight ceremony outside of it. It goes without saying, this treehouse is a hidden treasure! 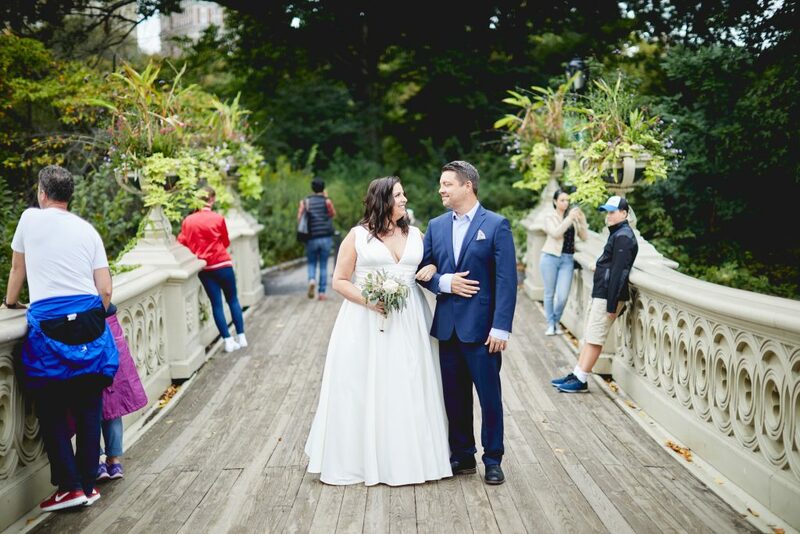 The Bow Bridge, located in the central area of the park, is one the most popular locations for wedding ceremonies and photographs. Bow Bridge is a 90-foot long bridge, two-thirds of which is sprawling over the lake, linking to the flowering landscape of Cherry Hill and the sprawling woodland of The Ramble. Bow Bridge, arching gracefully like the brow of an archer or violinist, is the oldest cast-iron bridge in Central Park (and the oldest in the nation). This calm and serene setting is a favorite for many styles of ceremonies. The Bethesda Terrace is one of the iconic landmarks of Central Park, and is located mid-park, providing access from both Fifth Avenue and Central Park West at 72nd. The fountain is one of the largest in New York, 26 feet high and 96 wide. It’s the only sculpture in the park to have been commissioned as part of the park’s original design. Known as the Angel of Waters, it features and eight-foot bronze angel standing above four small cherubim representing health, purity, temperance, and peace. There are a variety of ceremony locations in the area: near the Fountain, in the arcade (which is filled with stunning mosaics and interesting lighting), or the grand staircase and mezzanine. One consideration: the Fountain is a busy area, filled with Park visitors and, from time-to-time street performers, so it probably wouldn’t be the best location for those seeking privacy for their special occasion. If Central Park doesn’t quite fit your fancy, check out Prospect Park in Brooklyn. A little quieter a less-trafficked, you’ll love the escape this gem offers. Water features, trees, bridges, paths and scenery…Prospect Park has a bit of everything. If you’re interested in an architecturally aesthetic location, the High Line is the place for your small elopement. Once an above-ground central railway, transformed in early 2000’s, the High Line is a spectacular display of the merging of art, architecture and greenery! These landscape designs are the perfect backdrop to your small ceremony. Though quite public, this spot makes for a sweet setting. For a real city wedding, consider the Brooklyn Bridge Park. This park offers a stunning sweep of New York’s skyline. 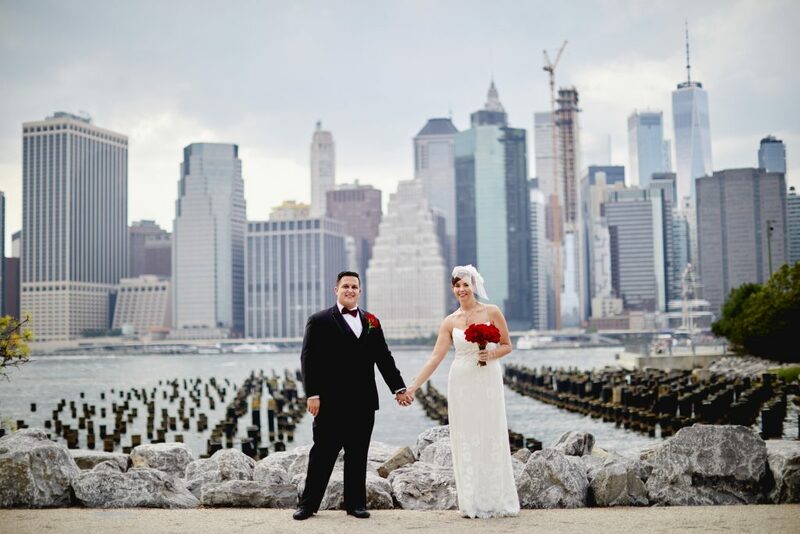 In addition, the famed Brooklyn Bridge is a stone’s throw away, making for a fabulous backdrop for wedding photographs. 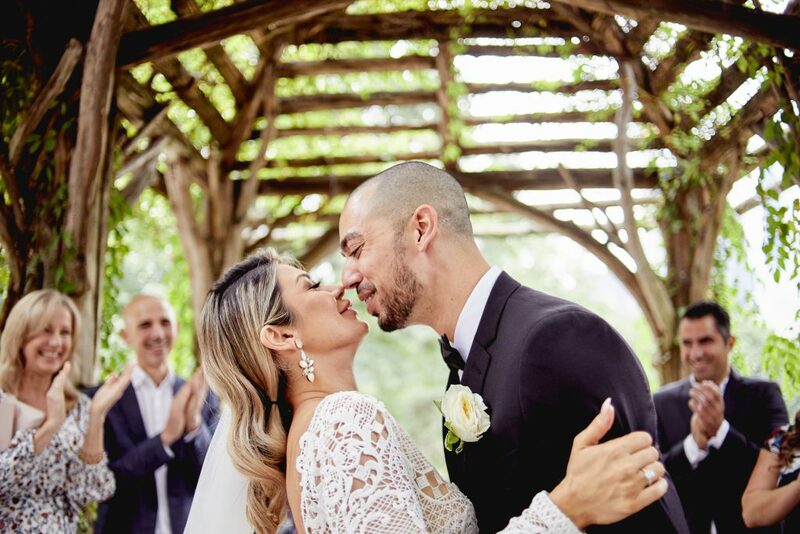 If you desire to have a ceremony that reflects the vibrancy of this international city, this may be the location for you. Although keep in mind that this area can get noisy with trains passing by! Description: Central Park is a very large park and sometimes the hustle and bustle can be an additional overwhelming piece of your ceremony. If you’re seeking a private, more quiet ceremony, we recommend The Pool. 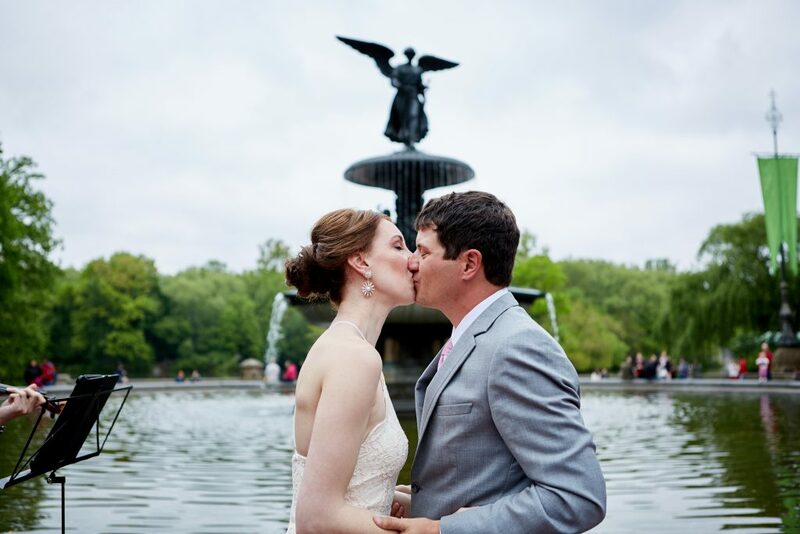 Get married to the backdrop of a beautiful body of water in Central Park. It’s lovely! For those colorful of heart and soul, Coney Island can be such a blast! While a very public location, you can’t beat the bright and delightful backdrops for your ceremony and portrait session. 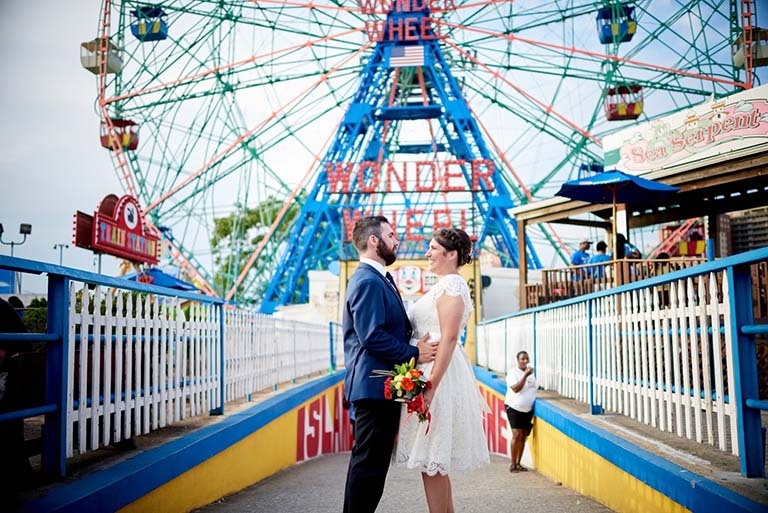 Say your vows and then hop in the ferris wheel for a NYC view that can’t be beat! Travel fees do apply. 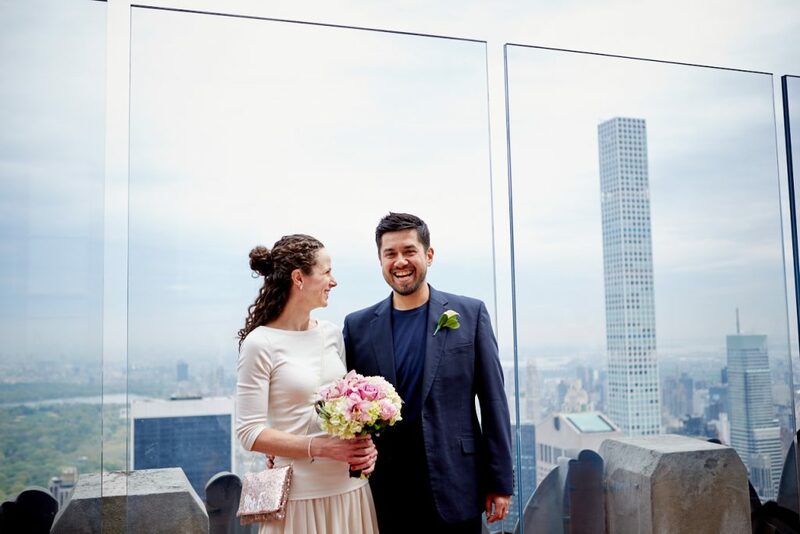 If you’re cool with getting married in a public place and love a god view, Top of the Rock is perfect for you. This NYC staple makes for darling intimate ceremonies. While you may have a couple of folks applaud when you say ‘I do’, we can’t recommend this place enough. Entrance fees do apply. 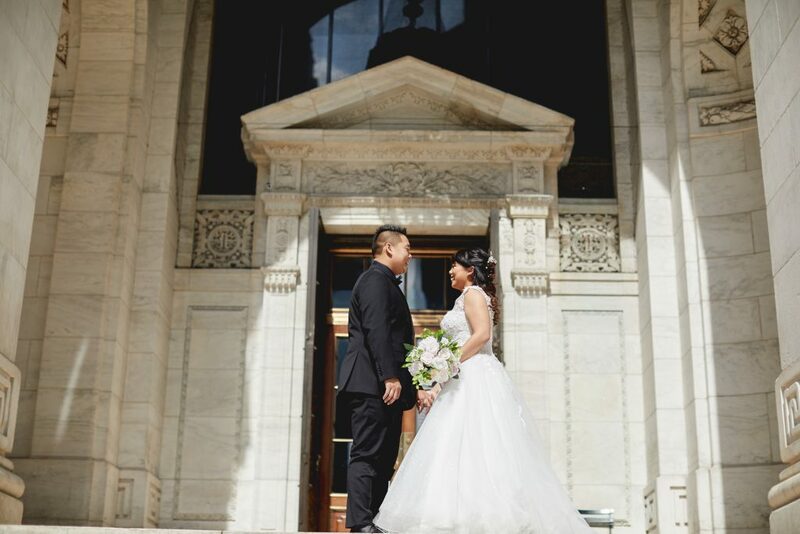 If you’re a sucker for unbelievable architecture and historic landmarks, The New York Public Library is a stellar choice to swap your vows at. While they don’t allow ceremonies inside, we’ve performed many ceremonies on the steps of this iconic location. The best part: it’s free! Second best part: the photos turn out stunning! 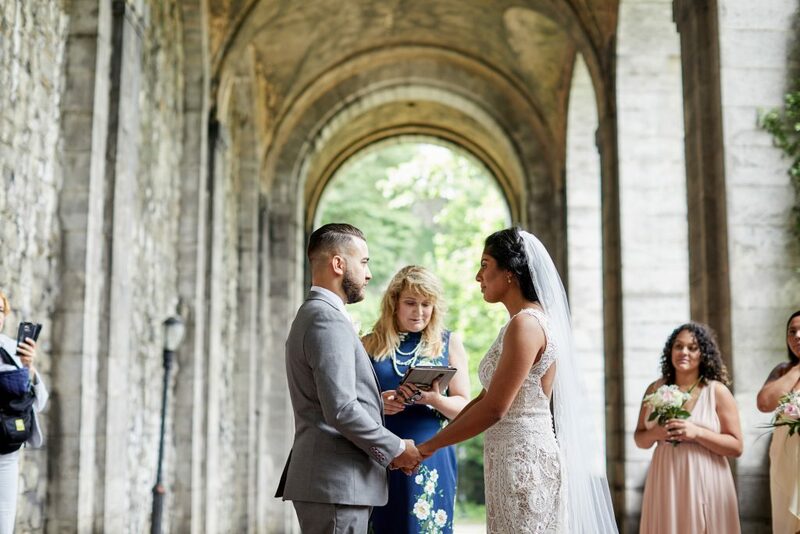 If you’re wanting something that is off the beaten path, but still stunning and original, we super recommend Fort Tryon Park for your ceremony. Nuzzled up against the Cloisters, from this park you get great landscape, stunning view of the water and unbelievable architecture from the Cloisters. 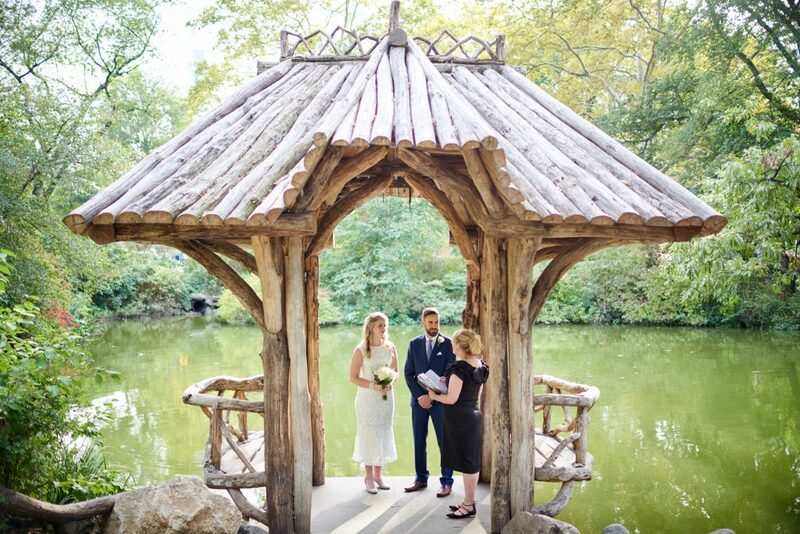 If you want something super intimate and supremely beautiful, we think Fort Tryon Park is for you!